She’s written books, sold pilots, and performed onstage, but it took the platform of podcasting to show comedian Julie Klausner the way forward. Show business is haunted by the myth of arrival; the idea of definitively “making it” in entertainment. The truth, of course, is that having made it is a temporary condition, and the red carpet can be pulled out from under you at any moment. If you manage to create a successful entertainment venture out of something you love to do, however, perhaps you’ve made something better than “it.” For Julie Klausner, that would be a podcast. 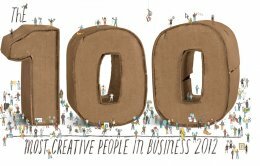 Klausner appears in Fast Company’s June 2012 100 Most Creative People issue. Click here to read her dialog with fellow comic T.J. Miller in the issue. Or click here to browse the full list. A veteran of the New York comedy scene, Klausner had already made her mark before she ever started sending out weekly dispatches via iTunes. She’d written for and appeared in magazines, television shows, and web series. Also, her first book, the dating memoir, I Don’t Care About Your Band, was optioned by Will Ferrell’s Gary Sanchez Productions and is currently under development at HBO. However, it wasn’t until she started her popular podcast, How Was Your Week? that she figured out what she was born to do (become the next Oprah, but funnier). In just over a year of recording interviews and monologues with producer Chris Spooner, Julie Klausner has gone from a total novice to podcast royalty, landing on best-of lists, being nominated for awards, and nabbing guests like Amy Poehler and Joan Rivers. Now she has her sights set on taking the successful show beyond its platform. Along the way, she’s also learned some lessons that apply to anyone trying to get a new venture off the ground or take an existing project to the next level. She shares them with us here. Klausner listened to a host of other shows to take inventory of what was out there, what she could do better, and what she would leave out. Drawing inspiration from friends like Tom Scharpling, who hosts the beloved Best Show podcast, she cobbled together a concept. Then she got her friend Spooner on board to edit the segments and she was off and running. It wasn’t long until the show began to snowball in popularity. Klausner tested out a couple different versions of How Was Your Week? before figuring out exactly what kind of show she wanted to do. The original intent was to have a guest answer the titular question. (You can still hear author Natasha Vargas-Cooper in the first episode talking through literally each day of her week.) It was a format that worked better in some instances than others. In one scrapped episode, for instance, Klausner talked to comedian Joe Mande, who had unfortunately just had a rather boring week. He’d been on the road, and much of his time had been spent doing shows and going to sleep afterward. Not exactly the stuff of legendary broadcasting. Another problem with the format was that the hyper-current nature of the interviews made them impossible to bank for later–they’d have to be recorded and aired in the same week. Barring a solution, the scheduling difficulties would severely limit the caliber of guests available. Recognizing that her show needed some tweaks, Klausner shifted the format around so that guests ended up talking about an ever-shifting array of topics while she began the show with a funny monologue about her own week, in order to justify the title. The transition wasn’t seamless, but it worked. “I’m always excited when I make it on anyone’s list–even if it’s for affirmative action,” Klausner jokes. “My attitude is, ‘Am I the token woman on this list? Because I’ll take it.&apos;” While the field of female comedy podcasters is indeed sparse, the real reason How Was Your Week? regularly ends up being mentioned alongside the best overall is that the show manages to stand out in a perhaps overcrowded marketplace. How Was Your Week? isn’t tethered to any single topic, which leaves its host free to go off in any given direction, be it books, movies, current events, or how reality TV’s Patti Stanger is purportedly made of snakes. Along with the wide variety of subjects, though, the show features an increasingly vast range of guests. Although technically a comedy podcast (and frequently funny), the second guest slot on the show has lately included authors such as Dave Cullen (Columbine) and The New Yorker‘s Susan Orlean. “The show has changed, Klausner says. “The more I do it, the more I realize it’s really satisfying to talk to authors and experts. It also adds a more unique point of departure from comics talking to other comics that are going to be on shows all week.” It’s a departure that leaves How Was Your Week? having more in common with televised talk shows than with other comedy podcasts. On March 31st, Klausner took HWYW? to L.A. for a showcase on the Comedy Central stage, featuring Billy Eichner (Klausner has written for his Fuse TV show, Billy On the Street) and BuzzFeed editor Katie Notopoulos, who’s been a previous guest on the podcast. While the host remains mum on the details behind this showcase, she makes no secret about her intent to get How Was Your Week? on television, and become New Oprah. Although she still takes on freelance writing assignments and recently finished her second book, Julie Klausner is basically working on How Was Your Week? full-time now. It’s a job that entails corralling friends into appearing on her show, and making new friends out of some of her idols after persuading them to be on it too. While she admits that she still has some things to learn about interviewing–for instance, when to listen versus when to interject–creating How Was Your Week? has taught Klausner something very important about herself.